Very nice condition – bought it from Honey Badger in 2016. $5,100. 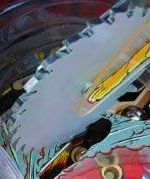 More info: boards have no damage (pics added), mods – shooter rod head and cliffy on Believe It Or Not scoop, some playfield LEDs, playfield is in great shape and no issues with game play. SOLD - and off to a good home!